Television was not as good as I expected. That (or something very similar) is what my bride said after our weekend in San Antonio. Her comment amused me immensely. Since moving to north Texas about 3 years ago, we haven't had television in our home. I just realized that might have been the final nudge that created our empty nest. Anyway, we have a (relatively) small and dated (analog) TV sitting in our living room, but it is only used for movies that we watch at a rate of 1 every week or two. I find this lifestyle fantastic, but my bride has been hinting that maybe we've gone too far. "We could be watching the Tour de France right now," she'd say with pretend concern for my entertainment needs. Interestingly, my business trips fuel the conflict. While she is home, bored, and lonely, I'm off at some glamorous location. I'm dining in fine restaurants, and more importantly, watching TV when I get back to my hotel. Actually, I don't see much television when traveling. On those occasions when I do succumb to temptation in a box, I'm repulsed. Try it sometime. Pull the plug for 6 months or so, and try to watch it again. I think you will find the images move too fast, the noise is irritating, and the messages are insulting. You will see advertisements that make no sense, sitcoms that are pathetic, and content that appeals to the basest animal instincts in people. So I return home with the message, "We aren't missing anything of value," and more determined than ever. Let me be fair. I do not want to suggest that there is zero value to television. I understand that there is some programming with value, that inspires the best in people, and is done well. I will not argue with you about the educational benefits and the advantages of monitoring current events. I suppose there are individuals that are very discerning and carefully plan their viewing habits. These people are adept at screening the trash and taking the treasure. But that is not me. My approach to television viewing is much more casual. I come home tired, have nothing urgent that needs tending, and decide (absent-minded-ly) to sit for a few minutes and do a little channel surfing. So I flip from one channel to the next. I find that one program goes to a commercial break, so I investigate other options. I find something that promises to be entertaining, but am soon surprised by objectionable content. So I investigate other options. I change, and change, and change, because nothing satisfies. Nothing satisfies, but I keep searching. Out of 247 channels, there's GOT to be something great here. Hours later, still surfing, I give up, rub my red eyes, and go to bed. I'm quite sure that I'm the only one who does this. If others were as pathetic as me, they would have given up on TV like I have. "I wonder how those Texas Rangers are doing? If we had TV, we could be watching them...right now! "...is what she says when I come back home from my trip. I'd respond, "Look, I tried the TV thing in (insert glamorous city here), and you won't believe how horrible it is." Then I'd add, "If you were to watch it again after so much time away, you'd find it lacking." So we planned a weekend in San Antonio. I had a couple of days of business, and she drove down to spend the weekend with me there. When friends asked what we had planned, I'd joke that we'd probably prop the pillows against the wall, sit on the bed, and watch television. I still think that she secretly wanted to get in at least a little TV time on the itinerary. 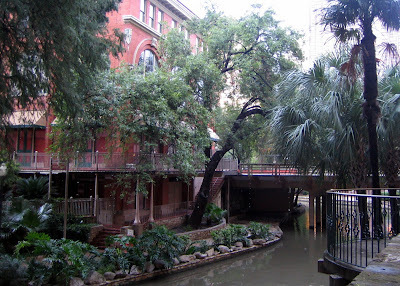 In reality, we did a lot of walking along the famous Riverwalk and around the downtown area. After dinner, we'd return to the room, longing to put our feet up, and..."Where's the remote?". So it was with hysterical amusement that I mentally processed her quote last night. I love my quiet home. I love my books. I love my bride. "He wants to keep it cheap and real, and I'm proud of him for that." The quote is taken from the very end of the book, "In Season, a Louisiana Falconer's Journal", by Matthew Mullenix. It is in reference to a friend's approach to a sporting endeavor. After reading Matt's journal, I see parallels between his approach to falconry and Kent's approach to cycling. It is an approach that emphasizes doing, and doing well, over equipment obsession and name brand recognition. The approach taken by these men is subject of considerable study for me, and I admire it greatly. I have made an attempt at simplification and keeping it cheap and real. I bought a Kogswell P/R and built it up with a fixed wheel. In the community of equipment obsessed bicycle geeks (at least), it is a modest machine. It is easily adequate for my needs. If I were to spend less time browsing the internet for cycling content and more time riding, I'd be fitter, stronger, more skilled, and have better stories to tell. But I tend to entertain myself a bit by admiring the tools of some of my friends, while neglecting their fine technique. 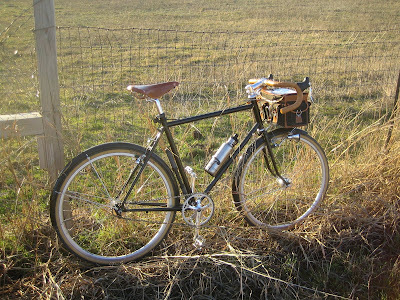 Now my Kogswell, is equipped with a front rack and luggage that is arguably not "cheap and real". ...I seem to remain highly susceptible to the siren call of "lugged and pretty". 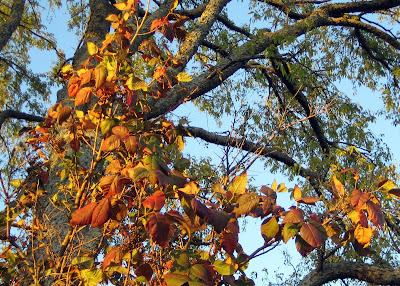 It is my understanding that northwest Denton County is not especially noted for its spectacular fall color. 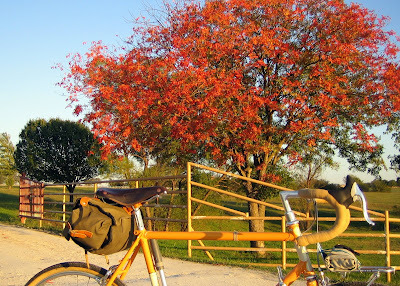 However, I've sung the praises of my modest little prairie home, and I've filled the pages of this blog with the amazing variety of things one can find simply riding around the (nearly) famous 3-mile loop. So I took a few minutes this afternoon to investigate. Oh well, I guess this'll have to do. 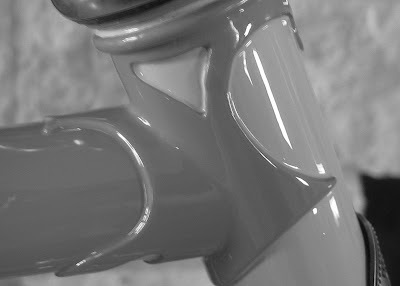 Recently, I've discovered a new answer for myself to the question, "Why the bicycle?" The fundamental answer has to do with the rewards that come from something done well. It became apparent to me while reflecting on the observation that, really, it is the only thing I do well. I've had more noble aspirations to be skilled in other important areas of life. I've sought to be a loving husband, a responsible father, and a leader in my church. Unfortunately, well-intentioned individuals have made me quite aware that I am deficient in those areas. I once thought of myself as one who had special insight to offer in those areas, and that with diligence I might be an effective leader. I now see the high standards of accomplishment and appreciate where I really stand. It is discouraging to realize this. I suppose it must be like an athlete who is cut from the team. He is forced to the realization that he has reached the limit of his athletic potential and must find another life pursuit. Before the cut, he sees himself as able to offer a unique and special contribution to the team. 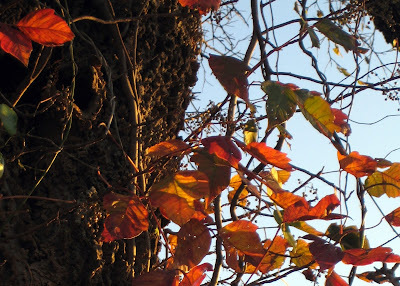 Then, well-intentioned others produce the facts, and reality crushes the spirit. He adjusts, of course, and so can I. The knowledge of God's grace and the forgiveness of those around me help speed the transition. There are other ways to serve and contribute. Let's not make more of it than what is. The bicycle is an escape. It is a coping mechanism. It is recreation and refreshment to the soul. The more important issues of life, of loving and serving, are those that warrant our devotion, in spite of the disappointments that sometimes come with them. We must see ourselves as we really are, find our place, and do our part to meet the needs around us. We can't all lead. Some of us have more humble roles, and when our pride is bruised, riding the bicycle can encourage and we can heal. It was like a rainbow. 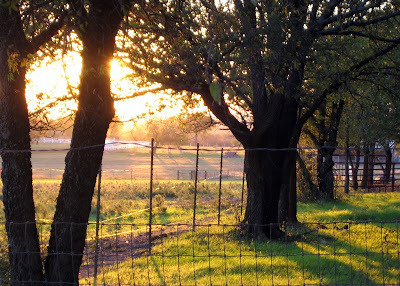 It was like when the sun shines after several days of rain and grey skies. A variety of colors all in one place and glowing. The BABBLE ride did occur as planned. There was a larger group than some of us expected. 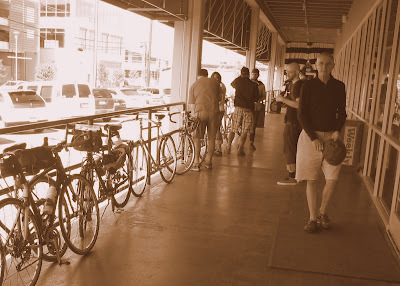 Word spreads, it seems, when there is something of interest to share, and the event was of sufficient interest that bicycle enthusiasts traveled from far reaches of the DFW area to participate. As I recall there were folks from Dallas, Flower Mound, Richardson, Irving, and even Ennis. My ability to join-in was initially uncertain, but little obstacles faded away, and I made the trek down from Sanger. It was primarily a social ride. The pace was conversational, the distance was decidedly not exhausting, and there were a couple of planned stops at local bike shops along the way. Those short intermissions gave folks with a love of the bicycle opportunities chat about the object of their joy. The diversity of participants was a delight. 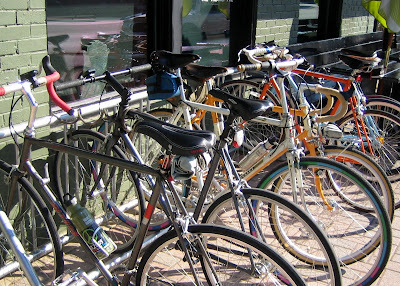 We had a wide range of ages and a wide variety of bicycle styles. 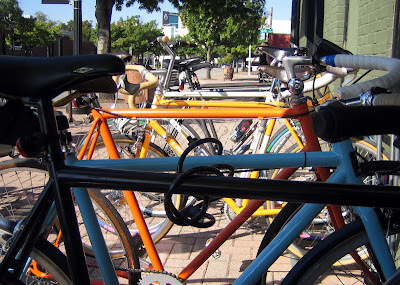 For a group of roughly 15+ it amused us all to have old and new lugged steel road bikes, mountain bikes, a beach cruiser, carbon fiber, fixed wheel bikes, old and recently modified 3-speeds, and a recumbent. I think our youngest participant, Rose, was a group favorite. 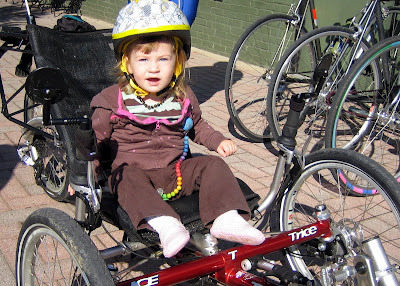 In the photo above she took a break from her trailer and tried on the recumbent for size. Plenty of growing room. We wandered through downtown and through nice older neighborhoods. We took our time and enjoyed perfect weather. We assembled for lunch and talked about bikes and cycling in our respective local geographies. We patted ourselves on the back for choosing to make the effort to travel to a social ride with folks we'd never met before. And we reminded ourselves that people with vastly different backgrounds, ages, geographic locations, and family situations can find something in common to share and bond us together. A paint palette of people and bicycles, like a bright rainbow of color after a many rainy days. 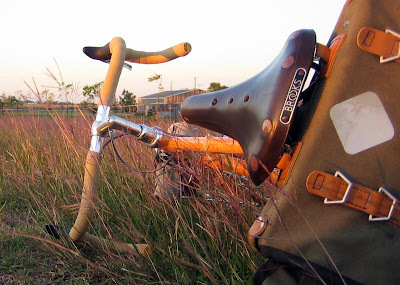 It is inevitable, I suppose, that folks who ride bicycles and enjoy writing about it would assemble together for a ride. There are a number of cycling bloggers in north Texas who have found each other through the internet's sticky web. 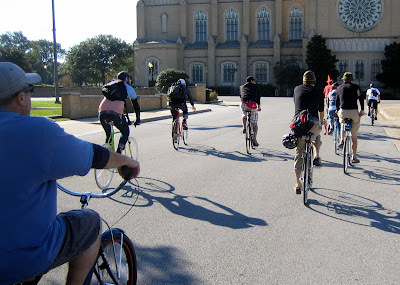 After a few one-on-one meetings of convenience, an idea was formed that a larger group ride might be an entertaining Saturday activity. After Myles (Fort Worth resident and Rat Trap Press mastermind) created a discussion group to plan such an event, details fell nicely into place. Rumor has it this loose association of bicycle riding writers might endearingly refer to themselves as Bicycling Authors, Bloggers, Bold-face Liers, & Exaggerators...or BABBLE, for short. 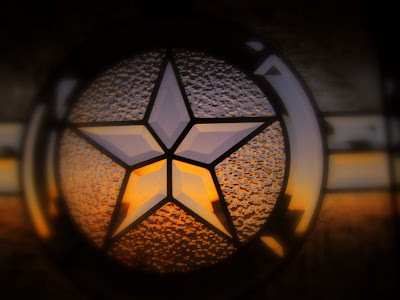 I might wonder here in public where such a silly name originated, while north Texas readers of this blog might suggest that I should fit in nicely with this group. 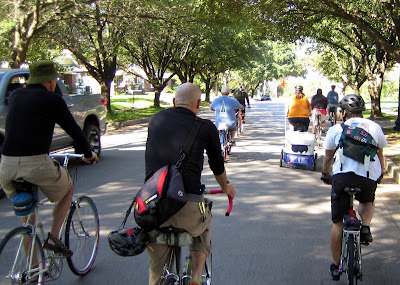 Everyone, that includes fixed gear riders, cruisers, 3 speeders, tandem riders, roadies, families, and even funky recumbent riders, you are all invited to Fort Worth on Saturday, October 17th, for a leisurely, slow paced, ride around Fort Worth. The ride is free. 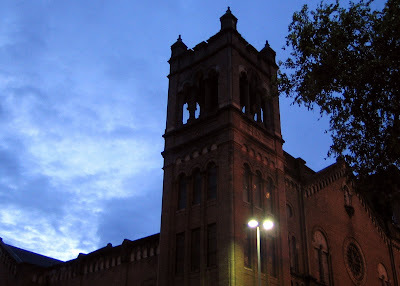 We will start at 10 AM at the Texas & Pacific (T&P) railway station located at 221 W. Lancaster Ave. in Fort Worth. Hopefully, with the start being at the train station, riders from other areas of the metroplex will be encouraged to attend. Here's a link to the train schedule. The ride will be a total of 13 miles or less with few small hills if any. 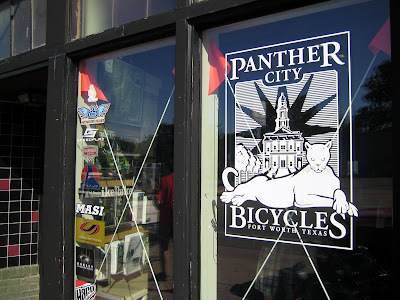 We will ride south from downtown to Magnolia Avenue stopping briefly at Panther City Bicycles. 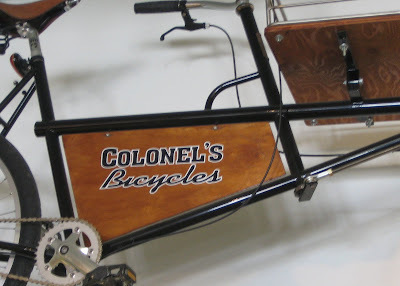 We'll then be heading south through the Fairmont area over to Colonel's Bicycles near TCU for another quick visit. The route will then take us north on the Trinity Trails to our main destination, lunch at La Familia (for you vegetarians, La Familia serves veggie tacos and chalupas). 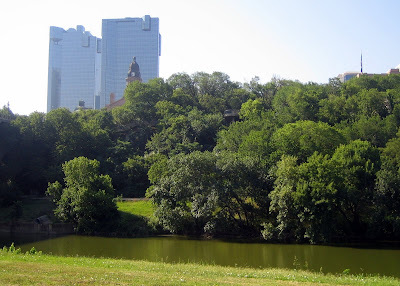 We will then make the short ride back through downtown to the final stop at the Fort Worth Water Gardens. The Water Gardens are just a stones throw away from the T&P station. This sounds like fun to me. Consider this an open invitation to participate. It has been designed to have wide appeal so that riders of all levels can share in the experience. Although it promises to be a wholly civilized and modest adventure, I expect when thoroughly documented by BABBLErs, it will grow to be an epic event. Therefore, I suggest that you don't miss it. This is, after all, history in the making. So I made the loop, sneezing and coughing, but grateful for the ability to get outside and pedal...even if only for a few minutes. I had a friend join me for a pondering duet for a few hours. He couldn't stay overnight, but came prepared with plenty of deep thoughts. He's a guy who wants to live life deliberately. The conversation was so good, I didn't even think about dinner until after he had to leave. So I prepared my dinner in dark solitude. I camped at the lake, as usual, but stayed in a different campground. Before leaving, I pedaled around and explored other areas. Now I've got a few select campsite options in mind for next time. I really am grateful that the S24O concept was created. I probably wouldn't have thought that it would be worth the effort. The secret, however, is that once you start pedaling away from the house, the pace of time slows, allowing one to get so much more from a relatively small amount of time. 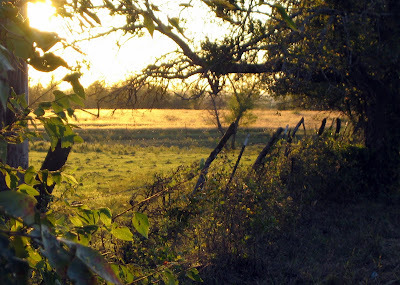 The S24O season in Texas has begun.